As long as you're operating out of what you've been told addiction is -and all the myths and lies that go along with that- you will never be able to choose beyond it. Marilyn Bradford, MSSW, MEd, CFMW, is an international speaker, psychotherapist and teacher who has worked in the field of addiction for over twenty years. She is the creator of Right Recovery For You, a radical and unique approach to ending any addictive or compulsive behavior. It was her own addictions to alcohol, food and the wrongness of self, and her unwillingness to accept addiction as a life sentence, that led her to creating this transformative and very different program. Growing up in an academic family that stressed the supreme value of logic and the scientific method, Marilyn knew from an early age that she was not going to fit well in this world. She was a square peg in a round hole. What others took for granted seemed insane to her. This was the beginning of the sense of fundamental wrongness of self that eventually led to escape through food, alcohol and adapting to other people’s realities. While searching for alternatives, she was introduced to Access Consciousness®. Here she found pragmatic tools and techniques that she could use to empower herself and others to move beyond the limiting belief systems that prevail,. 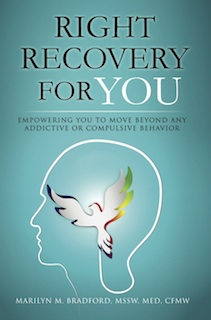 Seeing the vast improvement in her psychotherapy/addiction clients that came fro using these tools, she approached Gary Douglas, the founder of Access Consciousness, and together they founded Right Recovery For You.